The TR30LE offers all the features of our multi-award winning, top of the range TR30 including the UK's most accurate and comprehensive Quantum database, downloadable character voices and permanent satellite lock. 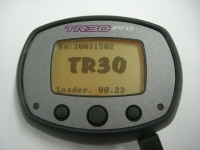 Laser detector and spare metal fascia are optional extras for the TR30LE and are available from the web store. * Speciality voices have been created by Giggly Bear Productions. TDS in in no way suggests these are the actual characters and respects the copyright and licences of the original artists.